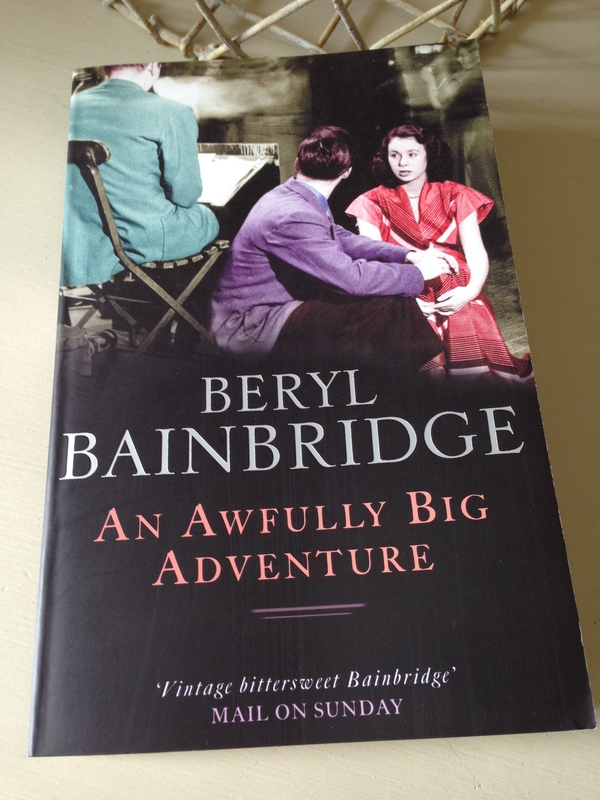 I’ve long wanted to read Beryl Bainbridge – her 1989 Booker-shortlisted novel An Awfully Big Adventure has been in my sights since Max reviewed it last year. So, when Annabel announced she would be hosting a Bainbridge Reading Week in June, it seemed the perfect opportunity for me to pick it up. Set in the early 1950s, An Awfully Big Adventure features Stella, a teenage girl who lives with her Uncle Vernon and his wife, Lily, in their down-at-heel boarding house in Liverpool. (Neither of the girl’s parents is on the scene, but the reasons behind their absence only become clear towards the end of the novel). Stella is quick and determined; she has the brains but not the discipline for schoolwork, preferring instead the environment of Mrs Ackerley’s ‘Dramatic Art’ classes where she goes every Friday after school. In his desire to see Stella do well in life, Vernon pulls a few strings with a friend to get her a meeting with the producer at the local repertory theatre, a rather handsome fellow by the name of Meredith Potter. At first, Potter and his colleague – stage manager, Bunny – don’t seem terribly interested in seeing Stella perform the piece she has prepared in advance. Nevertheless, they take her out to tea and Eccles cakes at a nearby café (a wonderful scene which Max highlights in his review). At the end of their meeting, Stella is somewhat surprised when Meredith offers her a role; luckily for her, she is to start at the theatre at the beginning of the new season, one of two juniors Meredith ends up hiring for the run. In due course, Stella meets the other members of the company, most of whom come complete with their own eccentricities and idiosyncrasies. This is a darkly comic novel, with much of the humour arising from the interactions between these characters as they go about their business at the theatre, all heightened by the various romantic attachments and professional rivalries at play within the group. Here’s a brief snippet to give you a feel for the troupe. There were three men and four women in the cast of Dangerous Corner, all of whom, save one, were under contract for the season. The exception was Dawn Allenby, a woman in her thirties who had been engaged for this first production only and who, two days into rehearsal, had fallen heavily for Richard St Ives. If she was served before him at the morning tea-break she offered her cup to him at once, protesting that his need was greater than hers. He had only to fumble in the pocket of his sports jacket, preparatory to taking out his pipe, and she was at his elbow striking on a musical lighter which tinkled out the tune of ‘Come Back to Sorrento’. At first, Stella finds herself doing odd jobs around the theatre, running errands for various members of the cast and getting to know how things work. Nevertheless, her lively imagination and rather forthright manner do not go unnoticed. There is something quite refreshing about Stella, and it’s not long before she finds herself in a cameo role in the company’s production of Caesar and Cleopatra. That said, Stella is still relatively young and inexperienced, especially when it comes to matters of the heart. In her innocence and naivety, she soon falls in love with Meredith, placing him on a pedestal in the hope that he will reciprocate her feelings. Meredith, on the other hand, shows little interest in forging any kind of attachment to the girl – unbeknownst to Stella, he is in fact gay. Things take a bit of turn for Stella with the arrival of P. L. O’Hara, a seasoned actor who is drafted in when one of the regular players breaks his leg in an accident. Having worked with Meredith and other long-standing members of the repertory team in the past, O’Hara has a history with the company and with Liverpool itself (a point of some significance within the story). In an attempt to make Meredith jealous, Stella gets involved with O’Hara, visiting him in his basement room several nights in a row – in essence, she thinks it might be useful to have a bit of experience under her belt for when Meredith finally gets around to showing some interest. It’s not long before the situation gets messy, but I’d better not say anything more for fear of revealing too much about the ending. I thoroughly enjoyed this novel with its sharp observations and darkly comic view of life. In some ways, it reminded me a little of Penelope Fitzgerald’s Offshore, a tragicomedy set within a community of barge dwellers on the River Thames in the early ‘60s. Bainbridge’s novel is perhaps funnier than the Fitzgerald, but with both of these books, one gets the feeling that catastrophe could strike these rather fragile people at any moment. Here, we know from the outset that things don’t end well for Stella. The novel begins with Chapter 0 — effectively a prologue that is revisited in the epilogue — in which she claims ‘I’m not old enough to shoulder the blame. Not all of it. I’m not the only one at fault.’ Only when we reach the closing chapters do we discover what Stella is referring to here. Alongside the comedy and dark undercurrent, Bainbridge brings a real feeling of warmth and affection to this novel, particularly in the portrayal of the various characters, most notably Stella’s Uncle Vernon. Vernon cares very deeply for Stella and doesn’t want to see her get hurt. He knows she is bound to change as she gets more involved with the theatre, and yet he is unprepared for how lost he feels when this starts to happen. Stella too is a wonderful creation. With her combination of adolescent innocence and frankness, she has a tendency to say exactly what pops into her head without thinking about the consequences, thereby inadvertently creating tensions within the group. Once again, I won’t go into the details as it’s best you discover these for yourselves should you decide to read the book. I’ll finish with a final quote, one that conveys something of the atmosphere of England in the early ‘50s, a time when the fallout from WW2 was still visible for all to see. Money is tight in Stella’s family, so baths are a once-a-fortnight luxury here – plus they all seem to use the same towel! It was inconvenient, Stella coming home and wanting a bath. As Uncle Vernon pointed out, it was only Wednesday. ‘I don’t care what day it is,’ she said. She was so set on it she was actually grinding her teeth. It meant paraffin had to be fetched from Cairo Joe’s chandler’s shop next door to the Greek Orthodox church, and then the stove lugged two flights up the stairs and the blanket nailed to the window with tacks. In the alleyway beyond the back wall stood a row of disused stables and a bombed house with the wallpaper hanging in shreds from the chimney-breast, and sometimes women, no better than they ought to be, lured men into the ruined shadows. For other perspectives on this novel, here are links to reviews by Cleo and Emma. An Awfully Big Adventure is published by Abacus Books. This entry was posted in Bainbridge Beryl, Book Reviews and tagged #ReadWomen, Abacus Books, Beryl Bainbridge, Boarding Houses, Book Review, Classics Club, Fiction, Penelope Fitzgerald, UK on June 14, 2016 by JacquiWine.